Metropolitan areas offer many opportunities and amenities that attract youthful movers. The benefits of “downtown” living include access to restaurants, museums and the arts, not to mention its proximity to major urban employers. If city living is in your future, you should prepare yourself for the challenges of relocating in an urban area. 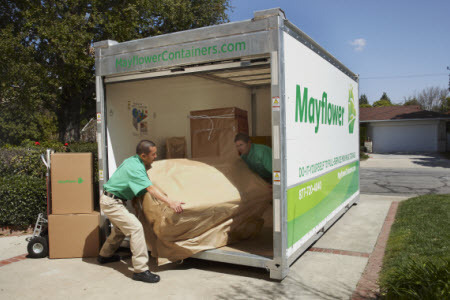 Consider these helpful tips from the experienced urban movers at Mayflower. Parking is usually at a premium in urban areas, so you need to check with the city about restrictions on where you can park your car and moving van on moving day. There may be exceptions made for people moving in, but you’ll need to determine this in advance to avoid a ticket or fine. Plus, you don’t want to alienate new neighbors by taking their parking places. It might be helpful to purchase a set of orange cones to place around your car on moving day, if that’s legal in your area. In addition, some cities have official “move-in days” scheduled, so you’ll want to be sure you are in sync with their calendar. And if you are using a professional mover, you may need to obtain a parking permit from the municipal government that will allow them to park on the street during loading/unloading. Additionally, some areas have truck weight restrictions on certain roads during certain seasons, which could affect the vehicle used for your move. Be sure to ask these questions of your municipal government, as well. The timing of your urban move can greatly affect the ease of the process. If you’re moving into a loft apartment or high rise, you don’t want to do so during high traffic times of the day because the elevators and entrances/exits will be bustling with people. An early morning or weekend timeslot works best, but be considerate of neighbors who are still sleeping. Some municipalities also have regulations against moving at night, so you need to check with your local government. Many loft and high-rise buildings have a freight elevator that they will allow you to use on move-in day or they will reserve an elevator for you. But you’ll need to get the pass or key ahead of time from the building manager and find out how long you will have access. You don’t want to abuse a good thing. Unlike moving into a home, where your car or moving van is parked right outside, moving into a loft or high rise means your belongings will be unattended for periods of time. You may want to ask a friend to sit with your belongings while everyone else is busy carrying things upstairs. Even if you have a dozen friends helping you move in, you probably will only have one keycard to your building. Propping open doors to the building jeopardizes the security of your neighbors, so plan your move so you and your helpers can take things up in groups. If you have any doubts about the lock on your door, consider changing it or hiring a locksmith to do so. You can also install a second lock, such as a dead-bolt, if it makes you feel more secure. Living in a building with dozens of other residents means you bear some responsibility for the safety of the community. Make sure to install a new smoke alarm or replace the batteries in an existing one, and purchase a fire extinguisher to keep in the kitchen area. Also, familiarize yourself with the fire exits. Remember that first impressions are often lasting impressions, and your new neighbors may be seeing you for the first time on moving day. There is certainly no need to dress up, but you probably don’t want to pick your oldest, most-tattered clothing to wear either. Even if the move becomes stressful or something gets broken, try to keep your temper (and your language) in check. Urban living comes with its advantages, but it may take some getting used to. That first night could be a sleepless one if you’re not accustomed to the noise level of the building or the city. You might want to purchase a set of earplugs in order to get a good night’s rest. It was awesome, that’s the only why I can put it in words. They came and packed everything up at the time they said they would and delivered as well.